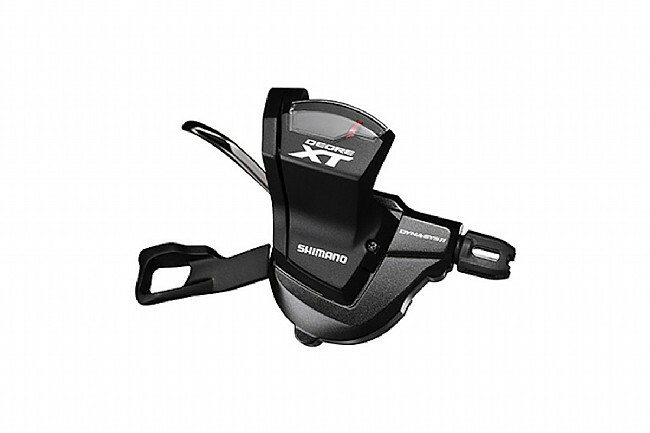 Try your hand on Shimano's XT M8000 11-Speed Rear Shifter and you'll quickly realize this is the crispest and most refined Deore XT shifter yet. Improved ergonomics include longer, textured lever shapes like those found on Shimano's top-of-the-line XTR group, and a lighter shift action results in effortless shifting all the way across the cassette. Instant Release shifts down during the first-half of the lever throw for unprecedented quickness, and multi-shift capability lets you move down 2 cogs or up 4 in a single pass. 22.2 mm handlebar mount. Also available in an I-Spec clamp version. Includes shifter, removable shift indicator with cover, low-friction cable, and cable housing. No thought shifting, just what youve come to expect. I upgraded shifter and rear derailleur on my Bad Boy2. Nice clean shifts you dont even have to think about.